Google Image Search (images.google.com) is an easy way to find photos on any topic or keyword. However, this image search service has one annoyance of having to click twice to able to view full sized photo displayed in search results. You can cut down on the clicking and webpage hopping by using either of the following method. Google Image Ripper is an online tool that allows you to directly view full size photos for any keyword. To get started: enter any keyword, select image result size among small, large, extra large and click ‘Rip Google’ to view full sized image search results. 1. Open Google Image Help plugin webpage in Firefox browser. 2. Click Install button for download and installation. Then restart Firefox browser. 3. 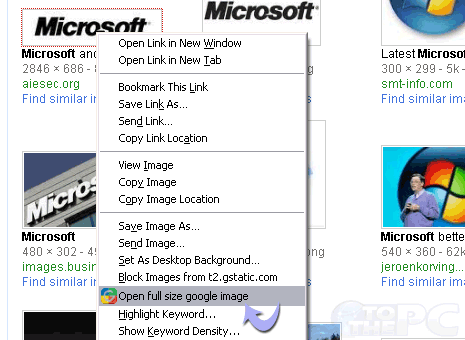 Now open http://images.google.com and enter any image search keyword like Microsoft. 4. To view full size version of any search result photo, just right click on the displayed thumbnail and then click “Open Full Size Google Image”. While in Firefox a special context menu option is added to preview full sized photos displayed in Google Image Search results – similar can be implement in Google Chrome using Go Google Image extension. It converts thumbnail’s outgoing links to respective full sized image links instead of links to webpages with the respective images. So to open full sized images, just right click on thumbnail photo and click ‘open link in new tab’ to directly view full sized version of photo. Alternatively, you can also use View Google Images Full script in web browser you use. It allows direct opening of full sized photo without need for multiple clicks on thumbnails result displayed in Google Image Search results. There used to be GIS extensions for firefox that made all images link to the full sized version in google. Don’t know what happened to all of those. I’m not really impressed with these latest solutions.